The effectiveness of ViviComb laser comb has been confirmed by the results achieved by patients using the low level laser therapy. The success of this device is shown in the pictures below. These pictures were taken before treatment and after 26 weeks of using ViviComb. Pictures provided by doctors and specialists, reflecting the results obtained by their patients are also included below. 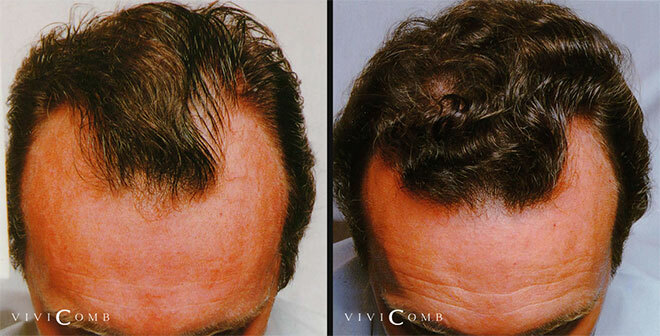 The above pictures show patients who have used ViviComb laser comb. It is difficult though to depict the real effects of the therapy, as there are many variables that affect photography. These include: exposure, light, hair color or hair moisture. Therefore, a visible result (that is increased growth of hair on the head) may be sometimes inaccurate in the photos.